The encapsulation unit is best suited for the generation of microbeads using matrices where gelling is based on interfacial coacervation (e.g. alginate, carrageenan and the like). With the heatable feeding equipment you can use encapsulate melts with temperature up to 120°. Which of these or any other matrix might suit your specific needs depends on material you want to encapsulate (e.g. proteins or bacteria), what properties the beads should have (physical strength, permeability, edibility, etc.) and which regulations and guidelines you have to follow (Hygienic Guidelines for Food, FDA etc.). A pressurized tank is used to generate a steady pulsation-free flow to the vibrating chamber. As an alternative, you can use a heatable pulsation-free transfer pump. 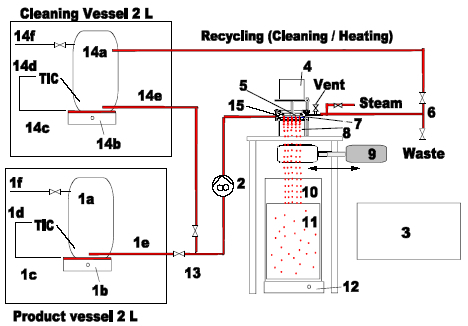 The bead generating unit has 13 nozzles. The vibration is superimposed on the product feed in the vibrating chamber by means of a membrane (frequency and amplitude can be adjusted digitally). The generated drops can be observed by means of an LED-stroboscopic light as stationary chains of parallel drops. The stroboscopic light is automatically synchronised with the adjusted vibration frequency. Monodisperse beads of the size between 0.2 and 1.5mm can be generated. Please use the Info-Form to ask for the adequate encapsulation system for your specific applications. Please note: You need Acrobat reader to display the following PDF - Files.